Domina el medievo y vence en todas las batallas y justas con nuestros trucos para el juego. 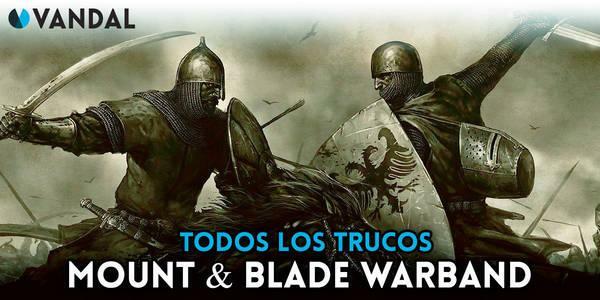 Mount & Blade Warband nos llama a tomar parte en combates entre grandes ejércitos. Esto, lógicamente, es de todo menos fácil. Así que para eso, la versión de PC del juego tiene una serie de trucos y comandos que podemos usar en nuestro provecho. Recuerda, antes de nada hacer un backup de tu partida antes de empezar a usar trucos, por si estropearas algo mientras los utilizas. Para poder usar trucos tienes que tener activada la opcíon de usar trucos. Esto sólo puede hacerse antes de empezar a jugar. Tienes la opción para habilitarlos o deshabilitarlos en los ajustes del menú principal. ¿Ya los has activado? Pues vamos al meollo del asunto. A diferencia de otros juegos, en este caso no hay comandos que haya que teclear, sino que todo se hace con combinaciones de la tecla CTRL y otra más. No debes usar el truco de nivel más allá del nivel 62. Este es el nivel máximo que se puede alcanzar y, si fuerzas que el personaje llegue al nivel 63, el juego se vuelve loco, te sube a nivel 2.000 y al mismo tiempo sube a ese nivel las misiones que escalan con el tuyo. Esto hace virtualmente imposible superar estas misiones. CTRL+Alt+4: Hace aparecer el nocheatmenu, si escribes "no" (sin comillas) y pulsas Enter, desactivas los trucos. CTRL+F5: La IA controla a tu personaje en combate. CTRL+H: Curación completa de tu personaje. CTRL+Shift+H: Curación completa de tu caballo (Shift, por si no lo sabes, es la tecla con la flecha hacia arriba, bajo el botón bloq mayus en un QWERTY estándar). CTRL+F3: Te haces daño a ti mismo. CTRL+barra espaciadora: Hace avanzar el tiempo mientras esperas en el mapa. CTRL+X: Da puntos de experiencia al miembro del equipo seleccionado. CTRL+X: Te da 1.000 puntos de experiencia para tu personaje (debes tener abierta la pestaña de tu personaje). CTRL+X: Te da 1.000 monedas de oro si tienes abierto el inventario. CTRL+Alt+F4: Deja inconscientes a las tropas enemigas en combate. CTRL+Shift+F4: Si mantienes pulsado el botón Shift, harás zoom. Esta combinación de botones dejará inconscientes a todos los enemigos sobre los que hagas zoom. CTRL+Shift+F6: Deja inconscientes a todas tus tropas. CTRL+F6: Deja inconsciente a uno de los soldados de tu tropa. CTRL+F4: Si se pulsa varias veces, deja inconsciente a un enemigo. CTRL+T: Te permite ver todo en el Mapa del Mundo, salvo los escondites. CTRL+L: Subes un nivel. Debes tener cuidado de no pasar del nivel 62. CTRL+clic izquierdo: Te teletransportas al lugar que selecciones (debes tener abierto el Mapa del Mundo). CTRL+F9: Cámara lenta (al pulsar otra vez, el tiempo pasa de forma normal). CTRL+F11: Detiene el tiempo mientras estás en combate. Pulsa de nuevo para que el tiempo siga corriendo. Get up Stand up Cleanse the town of bandits in the opening mission. Talking helps Engage in a conversation with a hero character through the party screen. Community Service Install and play one mod. Good Samaritan Help a lord or party win a fight. Abundant Feast Eat 6 different types food concurrently. Medieval Times Enter and win a tournament. Old dirty scoundrel Have a -50 relation with a lord, village, or faction. Royality Payment Be granted your first fief. Sold into Slavery Sell 5 people to the ransom broker. Knights of the Round Recruit 6 hero characters. Holy Diver Kill or wound at least 500 enemies. Help Help I'm being Repressed Harass wondering peasants on the map. Morale Leader Raise your soldiers' morale from low to excellent. Sarranidian Nights Camp in the Sarranid region of the map. Romantic Warrior Learn 3 poems from tavern bards. Force of Nature You and your army have killed or wounded 5,000 enemy troops. Art of War Have two of the following skills at a 5; Trainer, Tactics, Leadership, or Persuasion. Pugnascious D Pick a fight with a lord by insulting him or by challenging him to a duel. This is our land (MP) Your team successfully defended a castle in siege battle mode. None Shall Pass Successfully defend a castle. Trick Shot Land a shot with a difficulty of 10 while using a bow and arrow. Migrating Coconuts Visit every major town in Calradia. Book Worm Finish reading one book through the camping screen. Old school Sniper Land a shot with a difficulty of 6 while using a crossbow. The Bandit Raid 3 caravans and raid 3 villages. Happily ever after Get Married. Man Eater Kill 50 men as a female character. Look at the Bones! Face off against 100 enemies using custom battle mode. Khaaan! Kill 75 enemies with horse archery. Best served cold Defeat 10 enemy parties in the snowy regions of Calradia. Might makes Right Get either two strength related skills to 5 or one to 7. Melee Master Make one of your melee weapon skills 250. Talk of the town As a female character, raise your renown to 50. Agile Warrior Get either two agility related skills to 5 or one to 7. Mind on the Money Have two of the following skills at a 5; Looting, Inventory Management, Trade, or Prisoner Management. Medieval Emlak Become the owner of at least 5 fiefs. Calradian Tea Party Make your own faction. Dexterous Dastard Make one of your ranged weapon skills 250. Baron got back Win a battle against a lord or party who previously beat or captured you. Mountain Blade Kill 10 parties of Mountain Bandits. Gold Farmer Amass a fortune of 100,000 denars. Every breath you take (MP) In any multiplayer mode have more kills than deaths. The Ranger Have a 7 in one of the following skills or a 5 in two; Tracking, Path-finding, or Spotting. Sassy! As a female character get into a duel with male lord by insulting him. Concilio Calradi As a ruler have 3 vassals. Last man standing (MP) Win one round in battle mode. Calradian Army Knife Kill 10 enemies with a throwing weapon's secondary function. Trojan Bunny Maker Get the engineering skill up to 5. Got Milk? Steal 3 cattle from a single village. I dub thee Promote one of your followers into a position of power. Glorious Mother Faction (MP) Win a round of team deathmatch mode. Bring out your Dead Get one of your healing skills to 5. Victum Sequens As a ruler conquer 10 towns or castles. Queen As a female character, make your own faction. Lady of the Lake As a female character, give a companion character a great sword. Gambit Land a shot with a difficulty of 5 while using a throwing weapon. Autonomous Collective Be chosen as marshall. Choppy Chop Chop (MP) Slay 50 foes with slashing weapons. Man Handler As a female character, Capture and sell three NPC lords. Heart Breaker Get a character to elope. Kingmaker Put a pretender on their rightful throne. Elite Warrior (MP) Win a round of deathmatch mode. King Arthur You have completed the following achievements: Melee Master, Knights of the Round, Every breath you take, I dub thee/Good Samaritan. The Holy Hand Grenade Kill 75 enemies with throwing weapons. Throwing Star (MP) Kill 25 people with throwing weapons. Shish Kebab (MP) Perform 25 lance kills while mounted. Mace in yer Face! (MP) Kill 25 foes with a blunt weapon. The Huscarl (MP) Kill 50 foes with throwing axes. Girl Power As a female character, help a female claimant reclaim her throne. The Golden Throne Rule all of Calradia! Manifest Destiny Assist your faction in conquering Calradia. Spoil the charge (MP) Kill 50 cavalry while on foot, the enemy must be killed while mounted. Ruin the Raid (MP) Win in Conquest mode. Empress As a female character, become queen of all Calradia. Harassing Horseman (MP) Kill 100 people with mounted projectiles. Son of Odin You have completed the following achievements: Might makes Right, The Huscarl, Melee Master/Dexterous Dastard, and Holy Diver/Elite Warrior. Iron Bear You have completed the following achievements: Mace in yer Face!, Spoil the Charge, Agile Warrior, and This is our land. Legendary Rastam You have completed the following achievements: Abudant Feast, Mace in yer Face!, Sarranidian Nights, and Art of War/Melee Master. Svarog the Mighty You have completed the following achievements: Might Makes Right, Choppy Chop Chop, Glorious Mother Faction, and Old school Sniper. Kassai Master You have completed the following achievements: Trick Shot, Khaaan!, Agile Warrior, and Harassing Horseman.